These Meyer lemon quinoa pancakes are a thick, fluffy, lemony and sweet gluten-free pancake packed with an extra protein boost from the quinoa. *Post updated 1/21/2018 to include a video on how to make these Meyer Lemon Quinoa Pancakes. Scroll down to watch and enjoy these quinoa pancakes this weekend for breakfast! I’ve made (and eaten) a lot of bad pancakes over the past 5 years. You’d think pancakes would be something pretty basic; a hard meal to really screw up. The progression of my pancake concoctions over the last few years is a pretty good indicator of where I was/am on my health journey. 5 years ago, when I was first trying to lose the 20 pounds that crept up on me since college it was all about the calorie counting. And so my pancakes were a multi-grain, out of the box, precisely measured proportions kind of thing. They were usually pretty good as it’s kind of hard to screw up boxed pancake mix. But, as I slowly transitioned away from calorie counting and focused more on nutrient dense food, things like chia seeds, ground flax, pumpkin and an assortment of flours (oat, almond flour, rice flour, coconut flour, gf baking mix, etc.) worked their way into my pancakes and let me tell you, there’s a lot that can go wrong when you’re experimenting outside the safety net of all-purpose flours and a normal egg. 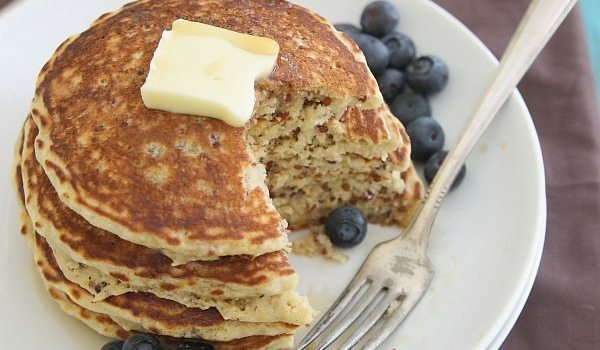 Pancake recipes like these oatmeal pumpkin pancakes, apple spice pancakes, cinnamon pear pancakes, pomegranate chocolate chip pancakes and gingerbread pumpkin pancakes were all winners during this pancake phase though. Chia seeds are great for things like chia pudding (see pumpkin chocolate chia pudding, blueberry coconut chia pudding and strawberry guava chia pudding for good examples of that!) but can get dicey as an “egg” substitute. Then there was the paleo obsession of 2012 which was like a double whammy; no dairy & no grains. A lot of bad, bad pancakes were eaten during that time. Although, these pumpkin paleo pancakes that came out of that phase are still one of my favorites and one of the top 3 most popular posts on this site. The paleo phase has subsided a bit, but having experimented with it for 30 days last year, I now know a lot more about how I react to grains, gluten and dairy. I definitely don’t need to eliminate any of those things from my diet, but when it comes to meals that can be made gluten-free or grain free and still taste good, I sometimes opt for that route because I know the benefits it brings to my body now. Why in all these 5 years I’d never had the thought before now to add some quinoa into pancakes is totally beyond me. I’ve added protein powder up the wazoo. Oh, that was another phase I forgot about. High protein EVERYTHING! Although that phase led to two of my favorite protein pancake recipes – perfect protein pancakes and these pumpkin protein pancakes. Not bad, unless you go overboard and end up with chalky tasting baked goods which happened a few too many times in the pancake department for me to really do that much any more. 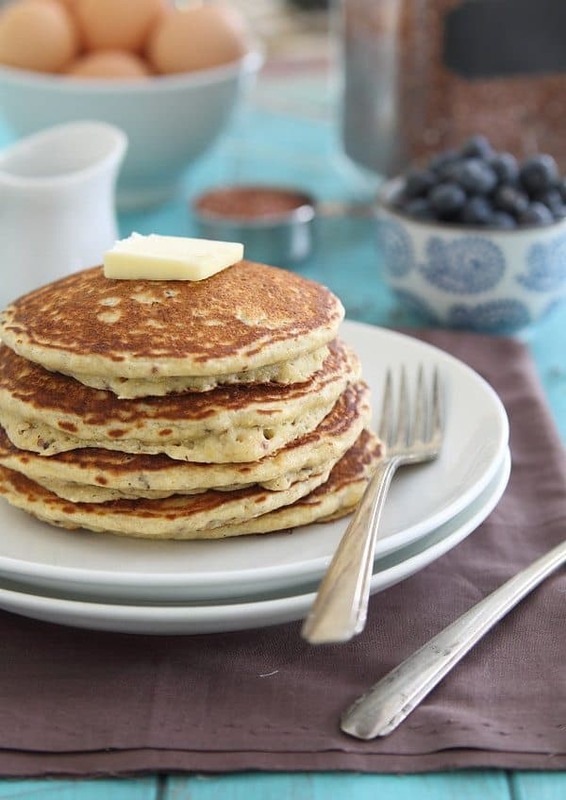 The quinoa gives these pancakes a nice protein boost and a fun texture. The blend of flours is like the gluten-free stars aligned because these pancakes are the perfect balance of dense and fluffy. I hate a thin pancake. These are the total opposite of that. And then there’s the Meyer lemon. Oh, how I adore those little guys. Why is it that we can get blueberries from Chile right now without pause but we can’t get Meyer lemons in the middle of the summer from wherever Meyer lemons grow that time of the year?! Anyway, they’re a bit milder than your typical tart lemon which results in a perfect lemony, sweet pancake. If the pancake roller-coaster had to end for me here with these Meyer lemon quinoa pancakes, I think I’d be ok with that. These meyer lemon quinoa pancakes are a thick, fluffy, lemony and sweet gluten free pancake packed with an extra protein boost from the quinoa. Heat a pancake griddle over medium heat. Combine flours, baking powder, salt and lemon zest in a medium bowl. Whisk together egg, vanilla, maple syrup, lemon juice, coconut oil and milk in a small bowl. Add the wet ingredients to the dry and stir together with a spatula. Fold in quinoa until incorporated. Grease the griddle with fat of choice and pour the batter on the pan to form about a 3-4 inch circle. The batter will be a little thick and will need some guidance with a spatula. Cook for about 2 minutes until starting to firm up around the edges and bubble in the middle of the pancake, flip and cook on the other side for an additional minute. I love your pancake journey. I have been victim of a few too many nasty pancakes experiences myself! 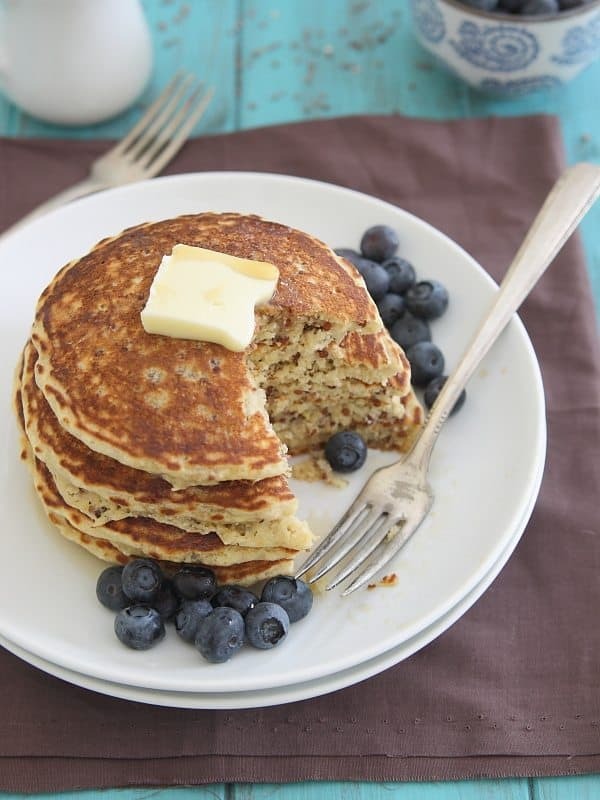 These pancakes look so light and fluffy and I love the texture that the quinoa would give! I have just started experimenting with quinoa in baked goods…so this is perfect timing! Plus, I am sort of totally obsessed with pancakes. I saw quinoa for the first time the other day and it was about $6 for a small bag. I better look online so I can make goodies like these pancakes! If you have an Adli’s in your area try them….Also quinoa may seem really expensive….I thought so too but the trade off is worth it….I half of a cup dry cooks up to twice the amount. Nice looking pancakes! I have a quick question, though – I don’t need to cut gluten from my diet, so I wonder if I use regular flour instead of gluten free, can I just substitute the same volume? I’m sure you could sub regular flour for the 1/4 cup of gf flour. Should be fine! I have a quinoa pancake recipe that I love, but they use AP flour, I need to try a GF version. These look pretty amazing. I’ve tried to make paleo pancakes a few times now, and without much success. I love the idea of incorporating quinoa into these! These sound crazy good! 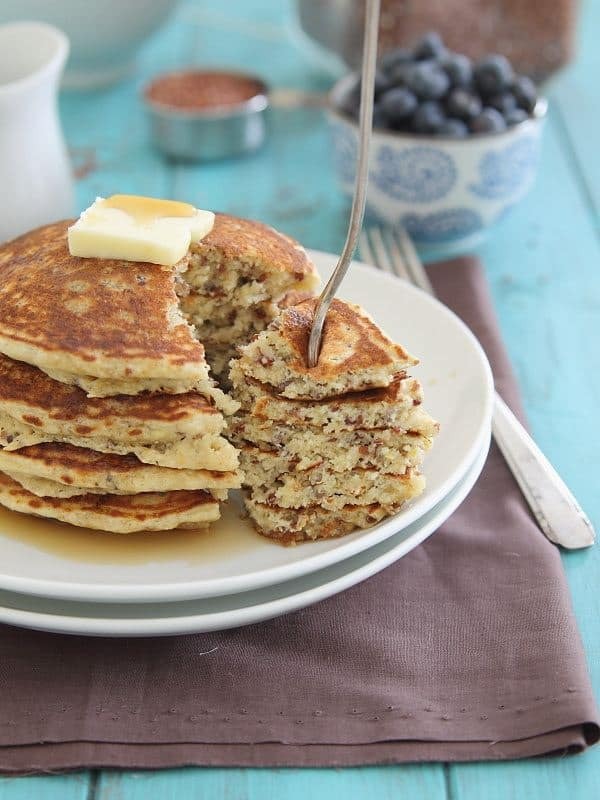 I never would have thought to put quinoa in pancakes, but why not? Such a great idea! I generally dont cook GF so Id have to literally go buy all the flours, but like you mentioned and Ive read a lot, that when we can eat GF without sacrificing flavor than its better…Ill have to do more research! Love the sound of these pancakes though! Looks so tempting.. beautiful presentation too.. love it!! I just got the most amazing idea ever: Come make me pancakes! Hooray! Ok but seriously, these look delicious and they sound even better. I never really thought to use quinoa in pancakes — very clever! These sound SO good. Beautiful pictures, too! These are beautiful and I love the flavors! I made these this morning for a Valentine’s Day breakfast and they are SOOOO good! These are definitely my favorite pancakes now. Thank you! I love anything lemon, so count me in for a stack Gina! I also love the addition of the quinoa! Wow the perfect healthier pancakes! Love these! Lemony pancakes are the best! Love the quinoa in these not to mention the bright lemon flavor! These are definitely worth waking up for! Love that these have quinoa in them! What a great way to start the day! I’m pretty sure they would freeze well!